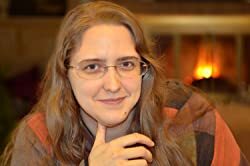 Ada Palmer is a professor in the history department of the University of Chicago, specializing in Renaissance history and the history of ideas. Her first nonfiction book, Reading Lucretius in the Renaissance, was published in 2014 by Harvard University Press. She is also a composer of folk and Renaissance-tinged a capella vocal music on historical themes, most of which she performs with the group Sassafrass. She writes about history for a popular audience at exurbe.com and about SF and fantasy-related matters at Tor.com. Too Like the Lightning is her debut fiction book. CLICK HERE FOR MORE STORIES BY ADA PALMER. Ada Palmer talks TOO LIKE THE LIGHTNING and gives away a book! Ada Palmer is true Renaissance woman: she's a professor by trade, specializing in history and the history of ideas at the University of Chicago, a Manga Scholar, composer, and has published the nonfiction work Reading Lucretius in the Renaissance. Palmer's fiction debut, Too Like the Lightning, is a complex and broad-reaching work of sci fi, that smartly wraps several interconnected mysteries within a serious suite of philosphical and cultural themes. I was able to grab some time with Ada Palmer as she was in the midst of promoting the book. One commenter with a U.S. or Canadian mailing address will win a copy of Too Like the Lightning. See below for details. Ada Palmer’s debut novel, Too Like the Lightning, is an absorbing, exhausting, and complicated work of science fiction literature. This is not the kind of book you can read in bits and pieces and quickly pick up the plot threads after watching a couple of nights of TV. Once you jump in, it’s best you stay focused, allow her world to wash over you and trust that Palmer’s taking you a worthwhile ride. 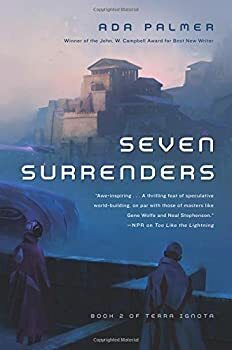 That’s the plot premise of Seven Surrenders (2017), the second book in Ada Palmer’s TERRA IGNOTA series. War is coming, and the many characters in this intricate tapestry of a series can’t stop it. Along the ways alliances are broken, people are betrayed, and secrets revealed. Jason reviewed the first book in this series, Too Like the Lightning. Unlike winter in George R.R. 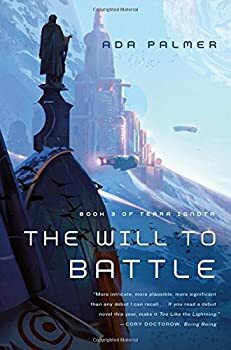 Martin’s SONG OF ICE AND FIRE series, the long-dreaded war in Ada Palmer’s TERRA IGNOTA finally does show up, or appears to, at the end of Book Three, 2017’s The Will to Battle. The war starts in the final six or seven pages of the book.